The first batch of graduates, along with officials of TOTALTEC Oilfield Services and the Minister of Natural Resources Raphael Trotman. Twenty-two students graduated yesterday from the inaugural TOTALTEC Academy Oilfield Safety and Operator Training and Development Programme and they were lauded for their outstanding performance and for setting a high bar for their successors. Among the graduates were former GuySuCo workers, who stated that the training they would have received while in the sugar industry contributed to their success in the programme. 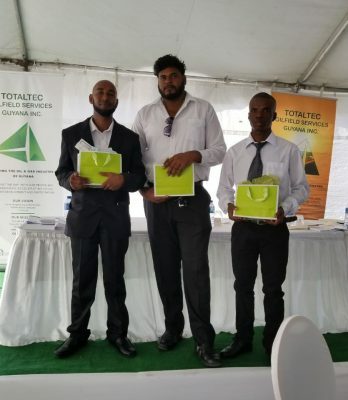 This batch of graduates is the first to participate in a nine-week training programme which was launched in February by TOTALTEC Oilfield Services. It was related that already, there are more than 50 recruits set to begin the upcoming training programme in June. Those recruits, who were present during yesterday’s graduation ceremony, were challenged to exceed the already high expectations set by their predecessors. “I’ve been in this industry for years and this is the first time we’ve went this far into training new graduates… One thing I have to say is every single person here passed every single exam they went through and they had high pass marks…what I’d also like to say is a lot of these courses that they’ve done are internationally-recognised courses. They are at a level that you’d be doing in any oil field all over the world and again, I’ve been training in every part of the world where there’s an oil industry and I’ve never seen so many people pass at this high level,” said Paul Thomson yesterday. Thomson is Managing Director of First Competence, the UK company that administered the programme and provided training material. The TOTALTEC programme’s top graduating students. From left are Courtney John (3rd best graduating student), Mark Bhikhari (best graduating student), and Dexter Vangronigen (second best graduating student). Apart from the general certifications, special awards were also presented yesterday to the top three graduating students. Those were Mark Bhikhari, who was awarded top graduating student; Dexter Vangronigen, who placed second; and Courtney John, the third best graduating student in the class. Bhikhari is reportedly among the group of graduates who transitioned from the sugar industry. His colleague, Davendra Lala, who indicated that he worked with the sugar company for 15 years, and was severed from the Port Mourant Sugar Estate, noted that because of the training they would have received from GuySuCo, it was easier to adapt, compared with the other recruits. Lala said that he has since encouraged eight of his former co-workers to apply, and noted that some successfully made it into the current batch of recruits. He expressed hopes that the others would make it into the next. “This is truly a testimony to the fact that the development and utilization of local content is a priority. With each passing day, we hear and see new developments that are occurring in this industry and I am very proud to say that as a member of the first batch of graduates, that I, along with my colleagues, are now part of these developments, which can only be considered as a great achievement for Guyana,” he added. The programme, according to an overview provided by the company, consists of 56 theoretical and practical modules, covering the categories of Basic Safety Awareness, Occupational Health and Hygiene, Safety and Environmental Best Practice, Emergency Response, Oil and Gas Operations, Lifting Operations, Transport and Cargo Handling and General Operations. Chief Executive Officer of TOTALTEC Lars Mangal related yesterday that some of the graduates will go on to be involved in internships and other training programmes regionally and further abroad. Mangal revealed that US oil company Schlumberger has offered scholarships to 18 graduates to travel to Louisiana to learn how to operate cement, bulk and liquid mud plant facilities, which will soon be brought here. That programme is expected to last three months. Additionally, he noted that Jaguar Oilfield Services, which is part of the Farfan and Mendes Group of Companies, has committed to recruiting some of the graduates as soon as possible to begin internships and training opportunities in Trinidad. Also, Mangal said that the Guyana Shore Base has requested at least 10 of the graduates to work on the maintenance team. 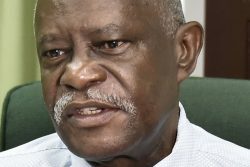 “If we can train and develop guys, and companies—world class companies like Schlumberger, Halliburton and so on—see these guys as good potential to be in their business, we feel satisfied that we have accomplished and made the milestone in terms of building capacity here in Guyana,” Mangal stated. “We wanted to make sure that we could build not only the pioneering spirit that we see in the young men here, but also a best-in-class attitude and behaviour and a professionalism that would be recognized by all the international companies coming into Guyana,” he related. It was noted that the course is entirely free to participants, as the academy bears the cost of the instructors, certification, as well as keeping the participants on their payroll for up to one year, while they are being placed in jobs in the industry. 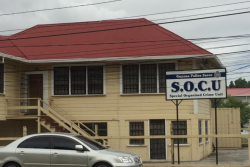 “In the effort to ensure that Oil and Gas capacity is built in Guyana, the key is that the most suitable Guyanese are recruited and that there should be no obstacles in the way of worthy candidates,” the company stated in a release. “We are building a bright future for the Guyanese to participate in our oil and gas industry…I think if we can do more of this and we can do it faster and better, this will exceed everyone’s expectations. We won’t be here in two or three years’ time looking back and saying we missed an opportunity to put 500 Guyanese into the industry or 1,000 Guyanese into the industry. We’ll be looking back and we’ll be looking at the managers and the instructors who are now all Guyanese and supervisors in the oil and gas industry,” Mangal asserted in his address.